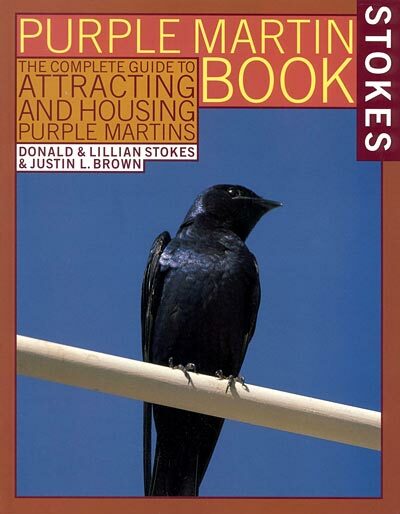 Purple martins are some of the most enchanting tenants in the avian world, and the Stokes Purple Martin Book can help you become a successful landlord for them. This book provides information for anyone interested in becoming a martin landlord, from the beginner to the longtime caretaker. Color photographs with informative captions dot the text, better illustrating each point. Life stages, nesting behavior, and migratory patterns are all explained in detail, as are photos of plumage variations. This work elucidates every aspect of a purple martin's behavior prior to their winter migration to South America. The bulk of the book discusses purple martins' housing needs—the right height, the best shape, appropriate opening shapes and sizes, predator guards, and many other pertinent details. Responsibilities of a landlord, such as monitoring and cleaning the apartments, are explained in detail, but are outweighed by the benefits of a martin colony in your yard. The Stokes Purple Martin Book is a comprehensive resource for any purple martin Lover.